MUIRIS DAN’S on John Street has provided a focal point in Dingle since its establishment in the mid- 1950s however since 2004 the pub has been gained an entire new generation of punters under the stewardship of Kerry Football Star Tommy Griffin and third generation publican Padraic Corcoran. In a town that is famous for its pubs and which at one time boasted a pub for every week of the year, Muiris Dan’s stood out as a place to enjoy a pint after the Mart, a place to do business in, to get some shopping or to get all the day’s news. 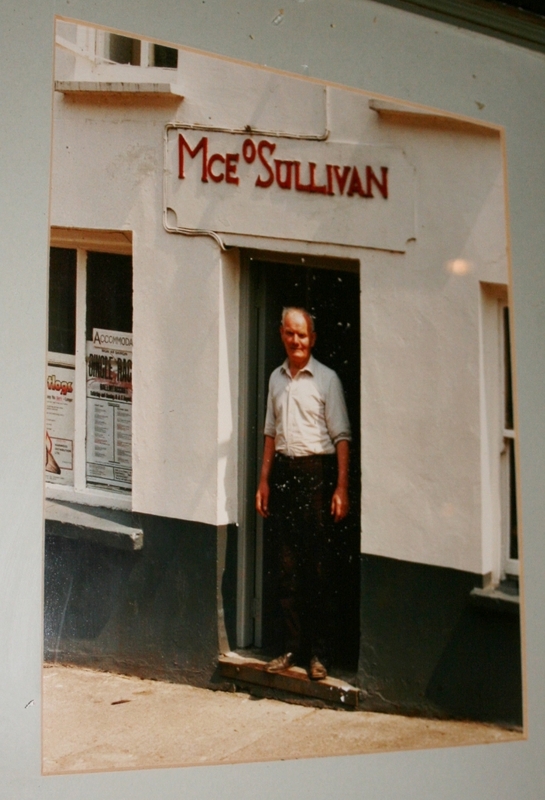 Muiris Dan O’Sullivan first ran a pub at the corner of John Street before acquiring Kennedy’s and MacDonald’s further up John Street, establishing a landmark business, which as a farm and feed suppliers, shop and pub, soon became a central part of life in Dingle and West Kerry. Today Muiris Dan’s pub is a vibrant hub, full to the brim of GAA nostalgia, and with two well-known and well-thought of young characters at its helm, it has engaged an entire new generation. In many ways Muiris Dan’s today embodies why Dingle is so famed for its pubs as it has managed to retain a sense of the past while at the same time providing a place where young people can mix with the town’s old stock, situated at the heart of the action on John Street just beside the Mall Bridge. Padraic Corcoran is the grand-son of Muiris Dan himself, the third generation of publicans in the family, who took over the running of the pub from his uncle Bernard O’Sullivan in 2004. Up until that point the premises had operated mainly as a farm supplies shop with a small bar which was only open during the day. Padraic embarked on the venture of establishing Muiris Dan’s as pub that could hold court with some of the bigger hostelries in the town, with lifelong friend Tommy Griffin who grew up just up the street in Marian Park. 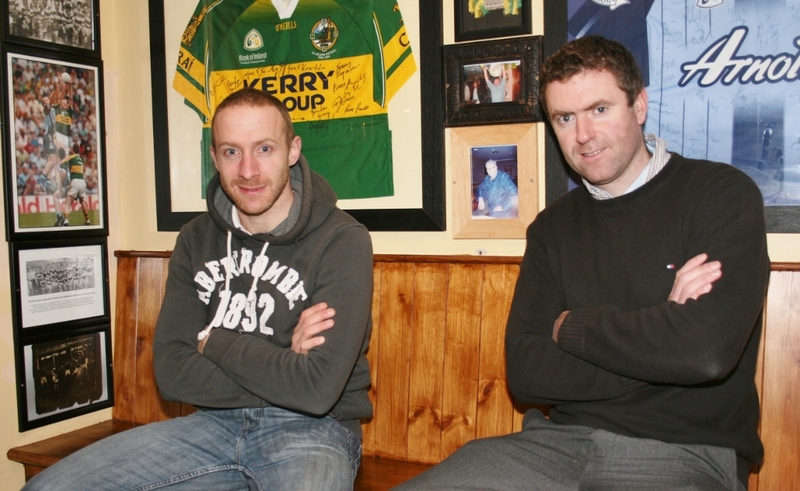 As one of Kerry’s celebrated footballers, with five All-Ireland’s under his belt, Tommy spent months collecting photographs and memorabilia and he and Padraic have managed to transform the pub into something of a Mecca for any football or sports fan. Padraic and Tommy officially opened the doors of Muiris Dan’s on December 19 2004 – a year in which Kerry won the All-Ireland and the same day that Lispole won the West Kerry Championship – with no less than Darragh Ó Sé, Dara Ó Cinnéide and Paidi Ó Sé as guests of honour. Since then football fans have beat a path to its door and both Tommy and Padraic have taken great time in sourcing Dingle GAA, Kerry GAA and other sporting memorabilia, echoing the legacy established by Padraic’s uncle Bernard who is himself an All-Ireland winner, having played with the legendary Kerry team of 1981. Reflecting on the seven years since the launch of, Padraic and Tommy have seen many changes. “It was important to us also that we acknowledged the past as Muiris Dan’s has played a special part in Dingle’s history,” Padraic added, taking a moment to look at the painting of his grandfather that has pride of place behind the bar. In addressing the economic challenges a country-town pub faces in 2011, Tommy and Padraic expanded their business this year. As well as now operating one of the town’s most popular nite-spots, they now also offer accommodation and the feedback has been very positive. “People are now looking for comfortable, clean and affordable accommodation and that’s what we have developed here,” Tommy explained. Tommy and Padraic are happy to be carrying on the tradition of Muiris Dan’s in John Street, while at the same time, looking towards the future. “It just came together at the right time and while it is a challenging business to be involved it is something we both love – the craic and the banter in Dingle is priceless, the characters you encounter on a daily basis are just brilliant, you wouldn’t hear the likes of it anywhere else and that is what keeps us going,” said Padraic. Muiris Dan’s, Sráid Eoin (John Street), Dingle can be contacted on 086-078 5575 or 087-917 7413.